The WBSK Workbench/Shelving Kit contains complete hardware, fasteners and plans to build a workbench or shelving unit. With the Simpson Strong-Tie WBSK, a couple of hours is all it takes to achieve professional results. It's simple to build with no angle cuts or bolts. Create strong utility furniture that will last for years and customize it to fit your space! The NewAge Products VersaRac J-Hooks are the perfect accessory to your VersaRac overhead storage unit. Built durable and safe with extra strong 13 gauge steel, these hanging J-Hooks will last a lifetime. They are designed with a powder-coated paint finish that is rust and scratch resistant. The fully welded steel hooks can support up to 15 lbs. of weight per J-Hook for hanging your cords, shovels or hoses on. They are easy to install onto your adjustable ceiling mounted VersaRac, and provides you the extra storage area you need, while regaining space to park your car. The NewAge Products VersaRac and 12 piece Multi-Hook Kit is an innovative solution for freeing up floor space in your garage or workshop. Durable and safe, the perimeter support beams are built with extra strong 13 gauge steel, with a rust and scratch resistant powder-coated finish, available in Hammertone Gray or High-Gloss White. The heavy duty VersaRac can support up to 600 lbs. of weight, and gives you up to 104 cu. ft. of overhead storage space to hold large and bulky items. The VersaRac is easy to install into wood joists and is adjustable in width from 6 ft. to 8 ft. allowing you to maximize your space while providing clearance for your doorway. It can be installed at a minimum height of 18 in. or can be adjusted from 27 in. to 42 in. in height. Store your winter tires, camping gear, or luggage within easy reach, while regaining space to park your car. The NewAge Products VersaRacs and 12 piece Multi-Hook Kit is an innovative solution for freeing up floor space in your garage or workshop. Durable and safe, the perimeter support beams are built with extra strong 13 gauge steel, with a rust and scratch resistant powder-coated finish, available in Hammertone Gray or High-Gloss White. The heavy duty VersaRac can support up to 600 lbs. of weight, and gives you up to 104 cu. ft. of overhead storage space to hold large and bulky items. The VersaRac is easy to install into wood joists and is adjustable in width from 6 ft. to 8 ft. allowing you to maximize your space while providing clearance for your doorway. It can be installed at a minimum height of 18 in. or can be adjusted from 27 in. to 42 in. in height. Store your winter tires, camping gear, or luggage within easy reach, while regaining space to park your car. WBSK Workbench or Shelving Hardware Kit The WBSK Workbench/Shelving Kit contains complete hardware, fasteners and plans to build a workbench or shelving unit. With the Simpson Strong-Tie WBSK, a couple of hours is all it takes to achieve professional results. It's simple to build with no angle cuts or bolts. Create strong utility furniture that will last for years and customize it to fit your space! 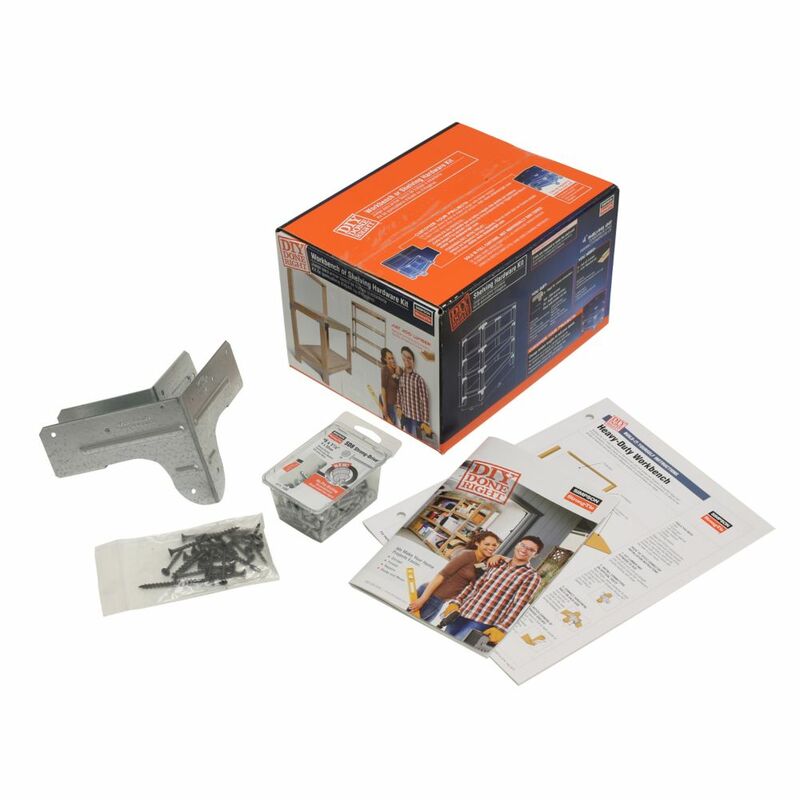 WBSK Workbench or Shelving Hardware Kit is rated 4.8 out of 5 by 116. Rated 5 out of 5 by RD from They do a great job. Making very sturdy shelves in... They do a great job. Making very sturdy shelves in a short time.The only complaint I have is Simpson’s Idea Book, its fairly vague and their YouTube site is not particularly useful to us who’ll use them for one project and that’s it. Rated 5 out of 5 by Fuertman32 from This is my third Simpson Strong-Tie Workbench in three moves.... This is my third Simpson Strong-Tie Workbench in three moves. It is always an enjoyable experience to assemble and use. Rated 4 out of 5 by Bert from Was what I thought it would be and I'm very... Was what I thought it would be and I'm very pleased with the item. Rated 5 out of 5 by Homer from Very easy assembly and fun project. Will order two more... Very easy assembly and fun project. Will order two more kits for shelving soon.